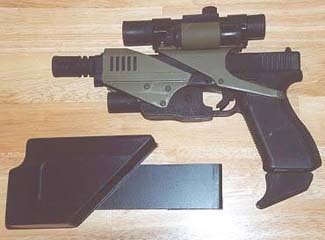 An interesting picture of a prop gun and holster from a cancelled TV show "Space- Above And Beyond." The prop gun is made from a	glock 17. They have added an old under-barrel laser sight with the laser module replaced by a white light to make a flashlight. Also attached is a M-16 type flash suppressor and a scope mount and combination optical sight/ laser pointer and an odd looking magazine extension.